Seidenberg student-faculty research pairs placed first on both campuses in the first-ever Undergraduate Student-Faculty Research Showcases. On the Pleasantville campus, Marc Kowtko (BS/IT ’15) and Professor Jean Coppola won for their work in open source assistive technology for older adults and people with disabilities. 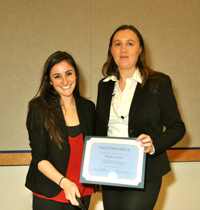 In New York, Meghan Kenny (BA/Psychology ’14) and Professor Christelle Scharff took first place for their collaboration on how mobile technology can be used to raise awareness around the world in regard to destructive environmental practices and to promoting sustainability. This year, under the leadership of Harriet Feldman, Interim Provost and Vice President for Academic Affairs, and Sue Maxam, University Director of Student Success, an initiative to promote collaborative research excellence between faculty and students at the undergraduate level was launched. Outstanding faculty-student pairs from across numerous disciplines worked diligently during the past academic year on a wide variety of projects. The campus-based showcases provided a forum for students to present their research findings to a broader audience and to be recognized for their work. Meghan Kenny presented “Mobile Solutions for a Greener Future” at the PIERS Student Conference: Encountering Nature Through University Culture held at Pace in March. In late April, she also presented “Mobile Applications for a Sustainable Future: How Are Mobile Developers Contributing to Solving the Problems?” at the 17th Annual Conference of the Northeast Region of the Consortium for Computing Sciences in Colleges (NCCSC) held in Hamden, Connecticut. 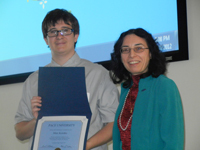 Marc Kowtko who, as a freshman, presented “Securing our Nation and Protecting Privacy” at the IEEE – Long Island Systems Applications and Technology Conference last year has been invited back to present his paper on assistive technology at this year’s event. As a winner, the Office of Student Success will support his attendance. In addition, two Seidenberg Scholars, Julie Gill (BS/CS ’12) and Brent McDonald (BS/CS ’12) pursued inter-disciplinary research projects working with Professor Jillian McDonald (Fine Arts) and Professor Nancy Reagin (History), respectively.